Welcome To The RackForms Blog. You come across a lot of cool ideas and trends when developing software, here's where we like to share them! The last release of the year's a big one, watch a video on it now! Two major releases in under a month? Why not! In this video we'll take a look at the new PayPal Express Checkout feature, which allows us to accept credit cards directly on our site, without having to transfer our users to a third party. We'll then take a minute to check out the brand new Joomla Direct Post feature. This guy allows us to open, view, and directly post forms to a Joomla installation! This is most likely the final release of the year, so I'd like to quickly say thank you to everyone who supported us through the years. Without your feedback and suggestions RackForms would not be what it is! A developer tour of RackForms Build 778, with an emphasis on the new Builder Indexed (BI) token, Code Editing Improvements, and Page Export Mode. One of the joys of working on RackForms is coming up with and then implementing world-class features no other form building solution offers. Today I'm proud to announce the immediate availability of one such feature, a brand new PDF Upload system. This is one feature that's going to save form developers countless hours of time and effort. The basic idea is we can now drag and drop a PDF file onto the RackForms interface; RackForms will then upload and process the form, taking all text and form field elements and converting them into HTML. You can watch this awesome new feature in action here, enjoy! RackForms sports an incredibly powerful form flow logic system, one where we can route to any page of a job at any time, and under any circumstance, input logic, and so on. Making sure we have a good handle on his this works is covered in this video, enjoy! As using a database to store images becomes more common place, making sure your form solution supports multiple ways to grab these images is important. That's why we're pleased to announce a easy and powerful new way to display database image content via the Image Modules: Database Image Properties section. This super easy feature allows us to pull an image or images from the database quickly and securely. As a quick bonus, I should also add our new RackForms build also ships with a full set of HTML 5 text field input types. These guys allow us to define a standard text field, then have compatible browsers add extra error checking and UI elements as needed. This is an especially powerful feature for mobile browsers, where, for example, setting a text field as type number forces the OS to display the number pad instead of the full text field block. This saves huge time for the user and leads to a better conversion rate. Alas, here’s a quick video that shows off the new database image technique, along with a more rounded discussion on how we send and then grab image data in RackForms! Let's keep the text short on this one and let the video do the talking -- in short, Build 774, released just a few days ago, introduces a fantastic new feature for all existing and future users - direct ASP.NET form code output. This means every RackForms user can now create native forms in both the PHP and ASP.NET platforms, literally doubling your potential client-base. This is just one more reason that if you need a form builder, it simply has to be RackForms! RackForms has a great set of built-in features, but sometimes we need to go beyond the core set and add custom functionality. We've got a perfect example in this post, where we add custom CRM API calls using the HTTP Request module. The big take-away here is RackForms never leaves developers without a way forward, no matter what the programming challenge. As always, please check out the video below for the two-minute demo! It's with great pleasure I announce the immediate availability of RackForms version 4.0! So what's new? This release marks the first of several 'usability enhancement' builds, the ultimate goal of which being to make RackForms faster and easier to use, without sacrificing any of the legendary power our users have come to expect. One such feature in this release is the Form Wizard interface. This feature allows us to use a simple wizard interface to rapidly build forms. We can set how many pages we need, the data delivery type, and so on. This is a great feature for all user types, as makes building forms a snap. A great example of a usability enhancement are new icons for the page headers. The old icons could be a bit hard to decipher at first, the new ones are much easier to understand. Small changes like this really add up and make RackForms a real treat to use! Finally, just because we make some things easier to use doesn't mean we're sacrificing power: RackForms 4 now ships with full support for MongoDB in the Query module. Check out some of these guys in action below, and thank you for checking out RackForms! Another day, another great new way RackForms saves you time! In this video we take a look at the brand new WordPress Post Update feature, where we can now access and embed RackForms jobs strait from the editor into WordPress posts! If you're a heavy WordPress user this new feature will save you loads of time, as now instead of needing to load up WordPress we can just stay in RackForms. Super excited to show of a great new feature, the XML Wrapper feature for the Flat File Module. The basic idea is using this guy means we can now create and then continuously write to an XML file on our file system. See this awesome new feature in action below! As always, if you have any questions please drop us a line! In this video we'll take a look at how we can use Conditional Processing Logic and Submit Routes to give our users the ability to select which payment provider they want to use on an e-commerce form. In all it's a simple technique, and most importantly, one that's transferable to other form logic tasks. Let's take a look at the video! Of course if you have any questions please drop me a line! I'm proud to announce the availability of RackForms 3.5, which brings with it the most significant updates of this release cycle. The changes are too many to list here, but the most significant are support for Google Docs and Stripe Payment Gateway integration. This is a great one! You can now write directly to your Google Drive account in rich HTML text or Spreadsheet format. We have several options for customizing the experience, as you can see above. We can set the document type, the file name, description, and so on. We handle all file creation and saving logic, and best of all we use OAuth 2.0 for all communication, providing an enterprise class level of security and protection. We can learn more about Google Apps for business here. Of course because this is RackForms we can mix and match this save mode with any other confirmation module. Save an email, write to the database, and hey, save to your Google Drive account! I'm super excited to see how our users will make use of this fantastic bit of functionality! This is another incredibly exciting feature. The basic idea is Stripe aims to make accepting payments online as easy as possible, both for users and developers. They do this in two main ways: first, they allow normal guys like us to accept credit/debit card payments without a redirect -- we do it right on our own site. Second, they shield us from all of the messy gateway implementation details and PCI compliance issues. We (that is, our server) never see or touch card information, which means we only deal with what matters -- the transaction result. But that's not all: Sure Stripe is already a fantastic service -- what makes it really shine is how we integrate Stripe into the RackForms ecosystem. 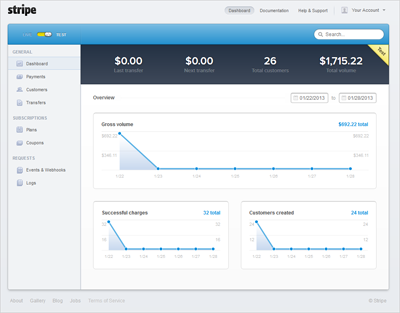 Unlike our other payment providers with Stripe we create a full, itemized invoice. This means we essentially get a shopping cart builder within RackForms -- all for the same unbeatable price RackForms has always been. The invoice, as you would expect, manages all parts of the transaction logic, and does so in as simple a way as possible. For example, because RackForms supports single and subscription items on the same form, will automatically add subscription data capture blocks to the invoice. Speaking of which, we also make sure to handle all aspects of a subscription request. We'll add the subscription item to the Stripe database servers, which means you never need to leave RackForms when creating your store. 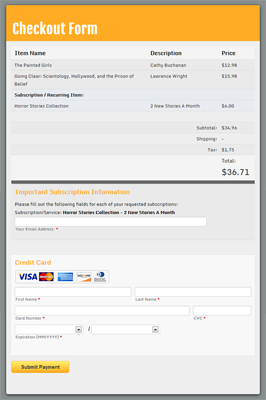 Of course the checkout form itself is highly customizable. We can set subscription and tax rates, whether we'll ask for billing and shipping info, and so on. The whole point of Stripe is to make E-Commerce easy to understand -- with RackForms we take the same approach, which means setting up your own credit card accepting store has never been easier! So there we have it. Two fantastic and powerful feature ready for the taking (and too many more to list here). Of course for all existing users this is a free update. Simply head on over to the downloads site and grab your copy! If you have any question about these or any other feature please give us a shout out. To help celebrate we've created a quick video to show these great new features off. If you like what you see head on over to the RackForms store to pick up your copy of RackForms today!